“If you’re looking for a chill, super sweet companion who is happy to curl up and be close to you, Clara is your girl. She is friendly with people, cats, and dogs and has lived with young children. Clara will seek attention and loves to give kisses, but is also content to sit quietly and watch out the window. Clara came in already front paw declawed. She is vetted, microchipped, and just waiting to meet you. 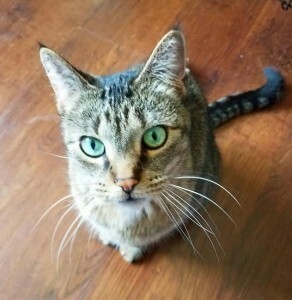 Her beautiful green eyes are sure to capture your attention and her sweet personality is sure to steal your heart”.